People with curly hair definitely know that it takes a special kind of hair dryer to get their hair looking great. If that’s you, we’re here to help! We’ve put together a list of the top ten hair dryers for curly hair so that you can make an informed decision about which one you want to try. Let’s get started with some information you should know before you start hair dryer shopping. Speeds: This is the number of speeds available on the hairdryer. Higher speeds can get your hair dry faster, but they also run the risk of being significantly louder to run than lower speeds are. 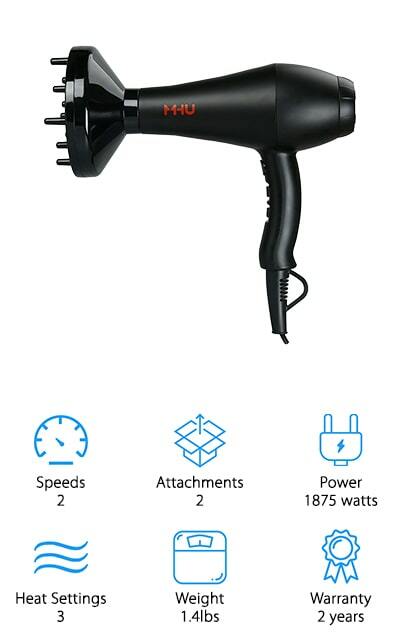 Attachments: How many attachments come with the hair dryer? Certain attachments do certain things, and you always want to have the right one on hand to achieve the look and style that you want. We’ll let you know. Power: The power in watts or amps can tell you how powerful the hair dryer is going to be. Obviously, the higher this number is, the more power you can expect from your device. Choose one that fits your life. Heat Settings: These are different and separate from speed settings. The number of heat settings will tell you what your options are for heating. For curly hair, more is definitely better in this instance. Having more options is the key here. Weight: How much does the hair dryer weigh? If you have a lot of hair or you’re going to be using it for long periods of time, you want a hair dryer that is as light as possible. Warranty: If there’s a manufacturing error with your hair dryer, you can report it within this warranty period to get a refund or a replacement depending on the company’s policy. It’s essentially insurance for your purchase. Now that you know all there is to know about hair dryers, we can show you our hair dryer for curly hair reviews! Our top pick and budget pick are our favorites, but we’ve also included a bunch of other hair dryers so you have a great selection. Blow through them all before you make your final decision! Your life is about to get a whole lot easier with these amazing blow dryers. Our choice for the top hair dryer for curly hair is the Dyson Supersonic. This unique dryer is the absolute best quality! It dries your hair extremely fast, due to the fact that it controls every facet of the airflow. About 20 times every second, the air temperature is monitored so that you never get air that’s warmer or cooler than you want. There are three magnetic attachments, including a smoothing nozzle, style concentrator, and diffuser that just snap to the front of the dryer with no additional work needed. There are four heat settings, including one that is constantly cold. There are 3-speed setting as well, so you can control how fast your hair dries. You know it’s a high-quality hair drier when it’s quiet - and this one is! The motor is acoustically tuned so that you get one frequency and it isn’t loud at all. Plus, even with the heat on, the dryer is cool! Another one of the best hair dryers for curly hair is this one from Conair. This ceramic dryer uses tourmaline ceramics to protect your curls against damage from the heat. 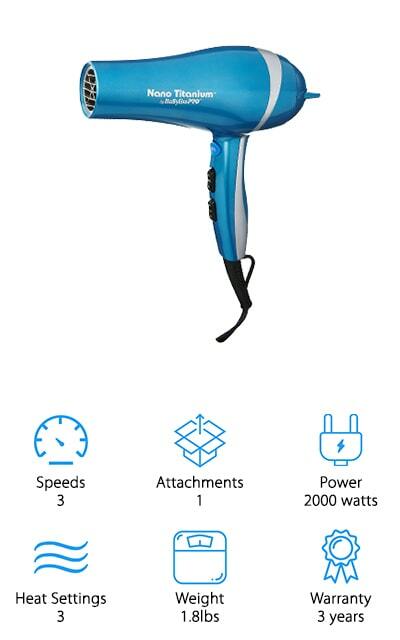 The motor is extremely powerful at 1875 watts and high-torque, so it will dry your hair super fast. There are three different heat settings, so you can choose the one that’s best for your hair type. Plus, for curly hair, you can use the diffuser attachment to help dry your hair equally and without damage. There are two different speed settings that you can choose from, and your hair will be shiny and will cut down on some of the frizz that you deal with daily. Plus, there’s a cool shot temperature setting that allows you to get your styles locked into place. The handle is non-slip so you can keep hold of it - and the 5.5-foot power cord will help you style your way! Another of the top rated hair dryers for curly hair is this BaBylissPRO Titanium. There are six different settings that cover heat and speed so that you can choose the way you want to dry, including how quickly it gets done. There is a removable filter so you can easily clean your hair dryer as well. The attachment it comes with is a concentrator nozzle so that you can get just one part of your hair dry and styled at a time. This powerful motor is an amazing 2000 watts, which we absolutely love. Your hair will be dry in no time! It includes a NaNo heat conductor that evenly distributes the heat in the air, so your hair is left feeling smooth while looking and feeling healthier as well! It also comes with a cool shot button for a blast of colder air during your routine. We love the use of ions in this dryer, too! This hair dryer by Bed Head is specifically engineered for curly hair! It’s a diffuser dryer, so you can use it with the diffuser attachment or without it. Both methods will tame all of your frizz and make your hair shiny and soft. There are three heat settings, including a cold shot button so that you can lock that style in. The cord is six feet long so it can reach across your bathroom if you need it to - it’s mobile! This hair dryer has an amazing 1875 watts of power, which is pretty amazing. It’s just as much power as a regular hair dryer packed into a diffusing one. The diffuser attachment helps your curls keep their shape while distributing the air more evenly around on your head. This works even with the cool shot temperature option, so you can set all of your curls at once! This hair dryer for curly hair is definitely a favorite! 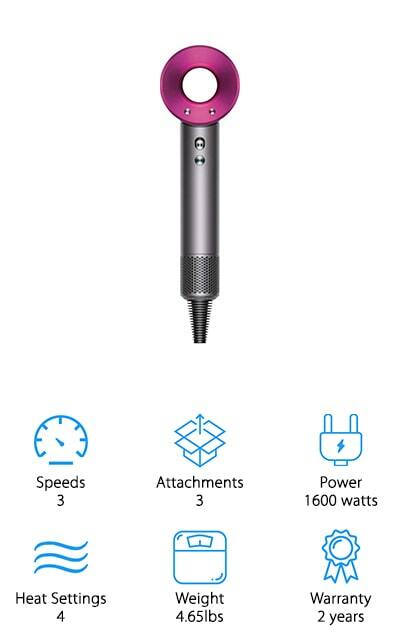 Jinri makes this Salon Grade hair dryer that’s great for professional and personal use! It’s extremely powerful with its 1875 watt motor. It’s lightweight and you can use it without fatigue because it weighs about 2.4 pounds. It won’t be loud, either, so you can dry your hair while others are sleeping for your best look first thing in the morning! There are three temperature settings, two different speeds, and a cool shot button to help you get your perfect look as well as drying your hair quickly. It uses negative ions and infrared to get your hair looking smooth and feeling moisturized while also protecting it against heat damage! This hair dryer gives you the flexibility to complete any look without the hassle! We love all of the different features and attachments, as well as the 2-year warranty on the dryer itself. This is a great dryer for use in your salon and at home. 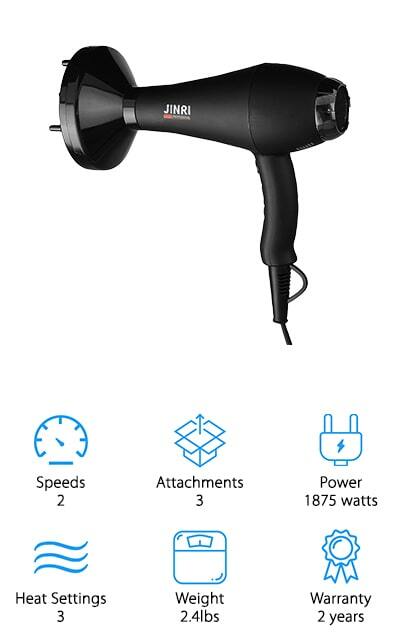 The MHU Salon Grade is a good hair dryer for curly hair because it comes with a diffusing attachment. It also takes every measure to help you control the airflow that you get, so you can protect your hair while your curls keep their shape. It’s great for families with multiple hair types because you can control just about every type of output. It’s a low-noise motor so it won’t sound like an airplane is taking off first thing in the morning. That is definitely a plus. The negative ion technology allows hair to dry quickly, without frizz, and with a reduced risk of being damaged. It comes with a concentrator and diffuser, two very different attachments that can be used on just about any type of hair. They do just what they say they do, so you can volumize your hair or get rid of frizz at the press of a button. It doesn’t get much better! Remington makes this combination dryer that uses the power of tourmaline technology, ceramics, and ionic air to help your hair get dry quicker and with less frizziness. When you dry your curly hair, you often get a lot of frizz. But this dryer will help to eliminate that problem. It also contains micro-conditioners to help stop hair damage. There are three heat settings you can set it to, as well as two-speed settings and a cool shot button to help secure your styles. There are two different attachments that come with the dryer, including a concentrator for styling and a diffuser for more textured hair types. The motor is a powerful 1875 watts that will get you all of the heat and even cool that you want. The two different speeds will allow you to customize how quickly you want your hair to dry. It’s a great, high-quality dryer that you can use every day! 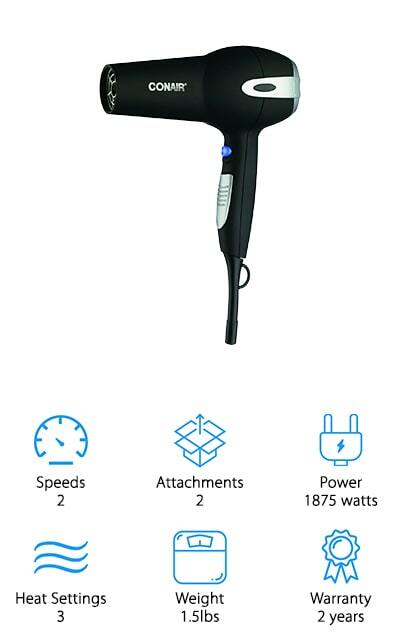 This Xtava Blow Dryer is a great professional tool that comes equipped with a diffuser attachment. It has an 1800 watt motor that you can use to get all of the styles that you want. 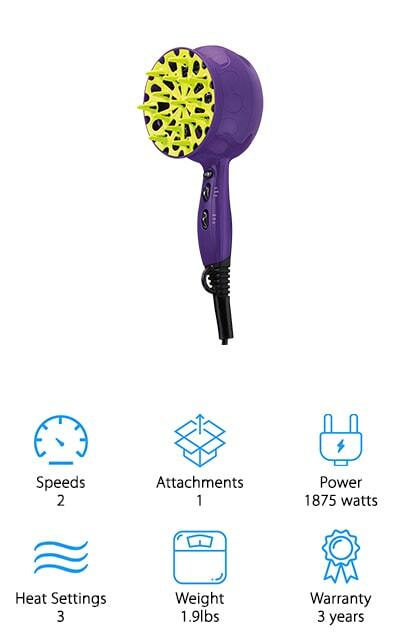 One of the unique things about this hair dryer is that it includes a double bristle brush with an ergonomic handle that helps you along in your hair drying journeys! There are two different heat settings with 3 different speed settings so you can get the texture you want while drying your hair. 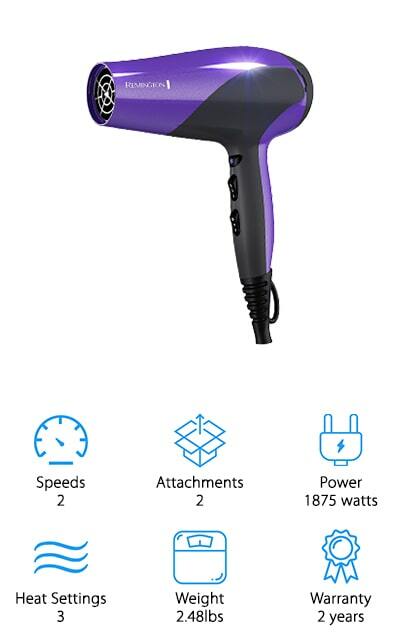 It also has a ‘secret’ button – the ‘P’ switch puts it on the highest speed setting and medium heat, which will help you style without damaging your hair. We think that’s pretty amazing. The cord is 5.9-inches long and comes with a hanging loop for storage that will keep your bathroom or salon organized. It’s a beautiful matte black with a rose gold finish that you’ll love! 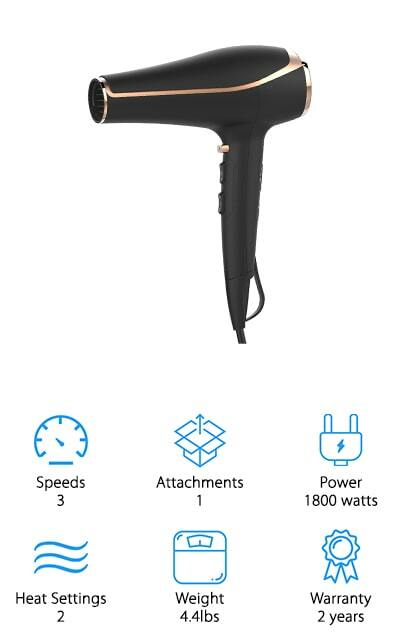 Our hair dryer reviews for curly hair wouldn’t be complete without mentioning the Lee Stafford Hair Dryer. This machine is powerful, with a motor coming in at 1875 watts. It’s a professional device that will get the job done quickly as well as quietly. There are three different heat settings as well as two speeds, with a concentrator nozzle for getting the hot air exactly where you want it to go. It only weighs about a pound, so it’s easy to list and use without dropping it! 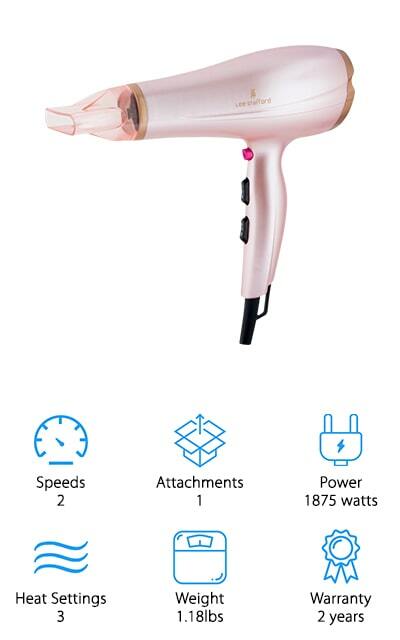 The unique part about this hair dryer is the coconut oil infused grill that uses technology to get your hair the nourishing nutrients it needs to get you smooth, silky hair that looks and feels healthy. When you’re going for both power and precision, this is the dryer to get. Plus, you can take the back grille off for better cleaning! That’s a pretty neat feature if you ask us. WATTS Tourmaline Dryer has an extremely powerful 1875 watt motor that will definitely blow your socks off! 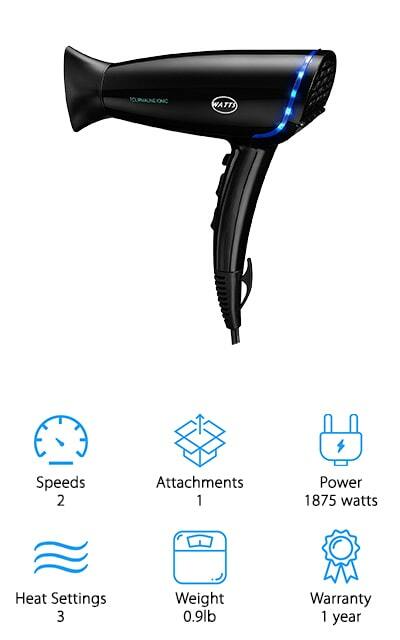 It has three heat settings as well as two-speed settings, as well as the cool shot system that you can use – together, they create seven different temperature settings so that you can effectively dry a variety of different hair types and textures. It’s lightweight at less than a pound and has a 9-foot cord so that you can use it even across large bathrooms. You can tie the cord up with Velcro when you aren’t using it so it doesn’t get tangled or in the way. You can remove the rear filter to remove lint and clean the filter so it keeps working well! This dryer uses Ion tech in order to reduce frizziness in curly hair and other hair textures. We just know that you’re going to love the way that it makes your hair look and feel!